Here in Switzerland, we’re living an amazing life with no boundaries and limits. Life is good here and we’re far away from hunger, pain, war or diseases . We’re sort of living in a bubble. Even more, it is important to help and to support others. And I personally believe, we must work hard an help as much as we can. It’s our duty to help. So you can trust me, I’m already working on other charity projects, hopefully we’ll be able to present them beginning of 2017. Since 2011, OMEGA has been a proud supporter of Orbis International, a non-profit organisation dedicated to treating avoidable blindness in some of the world’s most remote regions. Founded in 1982, Orbis International has successfully carried out programmes in more than 90 countries across the globe. Not only has it performed millions of medical and optical treatments on board its Flying Eye Hospital, the organisation is also dedicated to training new eye care professionals who can continue the great work in the visited locations. The partnership with OMEGA began with an insightful documentary called Through Their Eyes, and followed OMEGA brand ambassador Daniel Craig on his visit to the Flying Eye Hospital in Mongolia. The film proved to be such an effective tool in raising awareness of Orbis International’s life-changing eye care, that a new documentary, The Hospital in the Sky, was produced in 2015, this time featuring long-time OMEGA brand ambassador Cindy Crawford, who visited the Flying Eye Hospital with her daughter in Peru. Other OMEGA brand ambassadors have backed this incredible partnership too. In 2015, a series of print advertising featuring Nicole Kidman, Cindy Crawford, Chad le Clos, Michael Phelps and Sergio Garcia was released to highlight the work of Orbis and celebrate World Sight Day on October 8th. 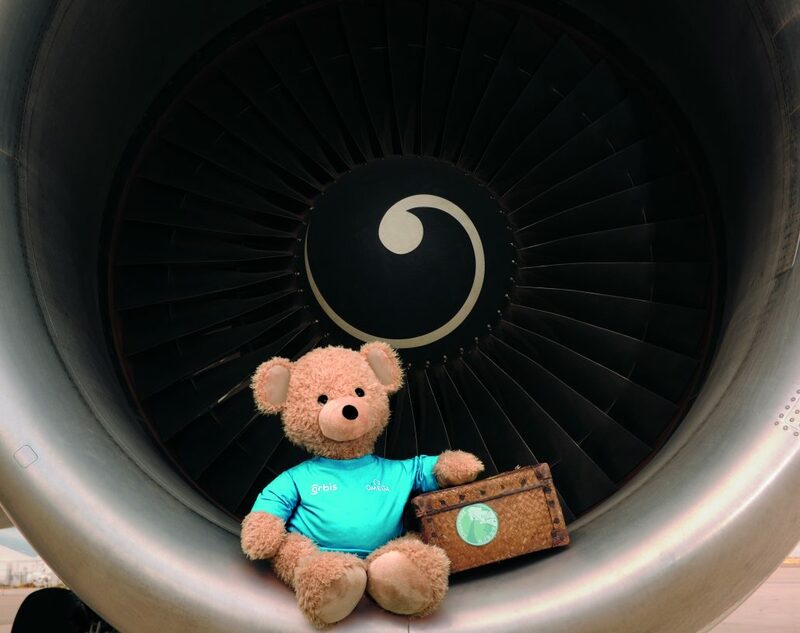 As well as raising awareness through film and advertising, OMEGA supports Orbis in several other ways, including the provision of teddy bears to young patients and the donation of vital funds. Three OMEGA De Ville Prestige watches have been created especially for the cause. Proceeds of their sales are earmarked for the organisation, giving customers a chance to select a fine OMEGA wristwatch and, at the same time, know that they are supporting a fantastic cause. With so much success so far, the partnership between OMEGA and Orbis is set to continue for many years to come. With the unveiling of a brand new plane, the future is looking very bright. Orbis proudly launched its brand new MD-10 aircraft. This updated jumbo jet serves as the newest Flying Eye Hospital and is equipped to perform the latest and most advanced eye care operations. 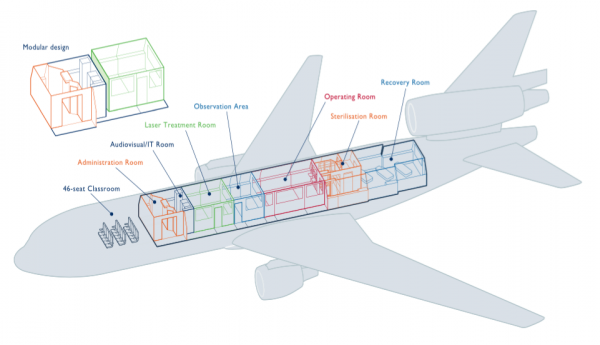 The Flying Eye Hospital is the world’s only ophthalmic teaching hospital onboard an MD-10 aircraft. It features a state-of-the-art, fully accredited eye hospital with technology that can transmit live surgeries around the world in 3D. Equal parts teacher, envoy and advocate, the Flying Eye Hospital not only provides a platform to train doctors, but also serves as a powerful machine for raising awareness, creating change and bringing local governments and global organisations, major donors and everyday people, together in the global fight to end blindness. A Classroom equipped with 46 seats where in-country medical colleagues can watch and interact. A cutting-edge Operating Room with full equipment and supplies. A Patient Care and Laser Room for anterior and posterior procedures. An IT /AV Room that provides the communications nerve centre of the plane. An Observation Room where visitors can watch live footage of operations. An Instrument Sterilisation Room that complies with the most stringent international standards. A Pre and Post-Operative Care Room where patients are prepared for surgery, and also where they recover afterwards. A Biomedical Work Area that houses the tools and parts necessary of surgery and donation. Patient and Staff Changing Rooms. And a Forward Work Area that houses modified aircraft galleys. 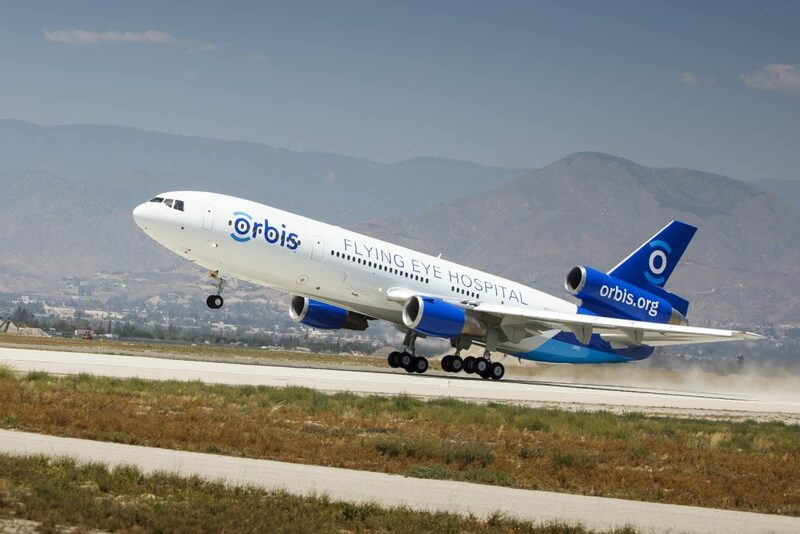 After its launch in LA, the first missions of the new Orbis Flying Eye Hospital commenced in September 2016, with visits in China and Indonesia. Undergoing eye surgery can be a confusing and scary time for children. That’s why OMEGA and Orbis came up with a simple way to soften the procedure – a cuddly teddy bear. OMEGA provides this friendly companion for every young Orbis patient. It makes it easier for doctors to explain what’s about to happen and gives comfort to the children before and after surgery. 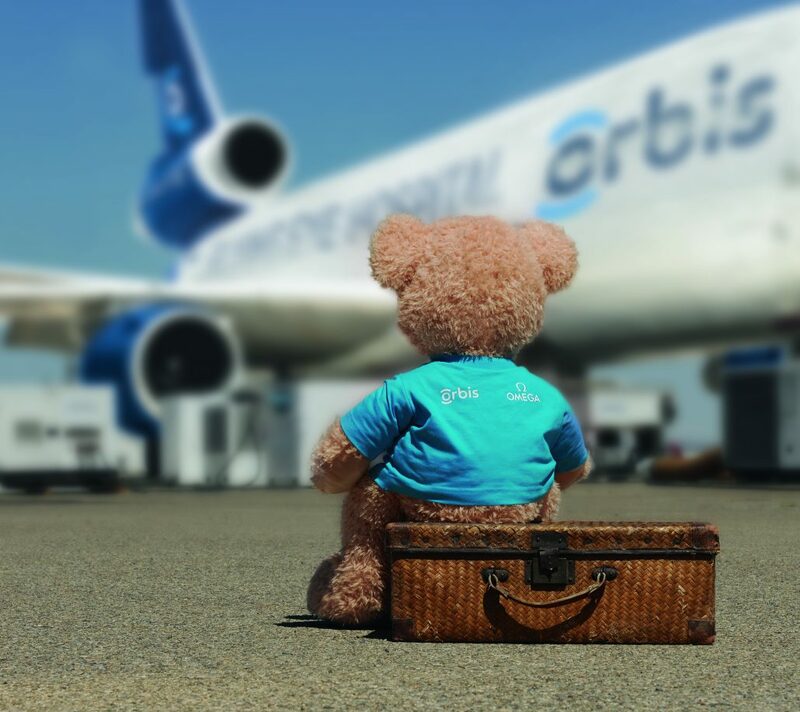 As well as being a big hit with the children, the teddy bear has provided a playful way for OMEGA’s brand ambassadors to raise awareness for Orbis International and their fight against preventable blindness. 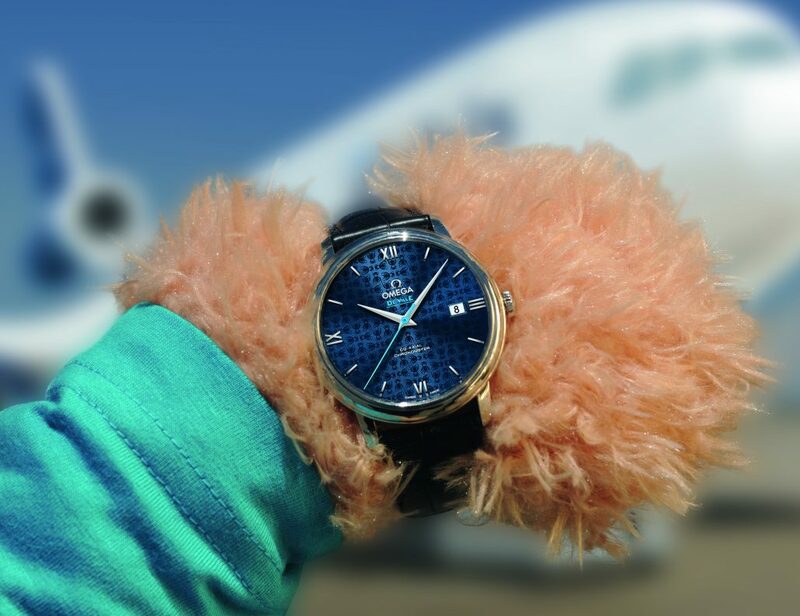 The cuddly toy also graces the design of the new Orbis watches. Used as an inspired pattern, the OMEGA teddy bear can be found on the dial and caseback of all three De Ville Prestige watches. OMEGA offers three De Ville Prestige timepieces that celebrate the brand’s partnership with Orbis International. Along with the Orbis colour blue, the comforting touch of the teddy bear has been used as the inspiration behind this playful watch collection. 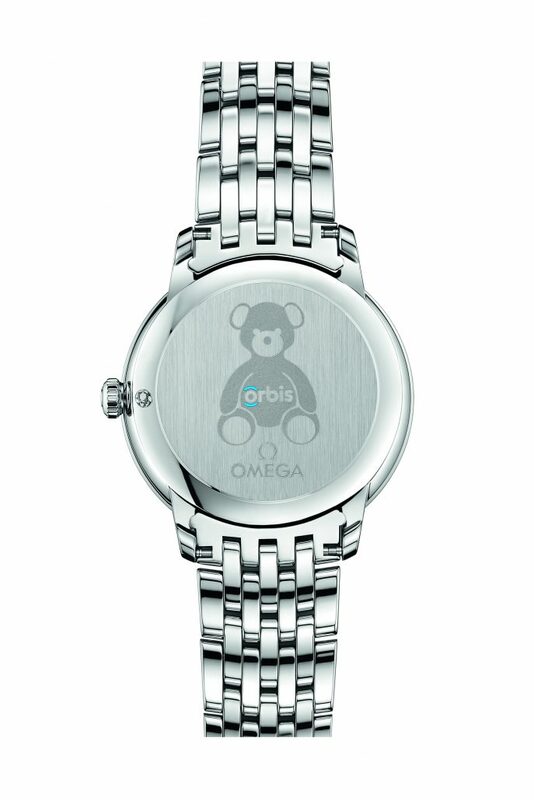 In fact, the teddy bear logo on the vertically brushed caseback has been specially designed just for these watches. OMEGA will donate a portion of the De Ville Prestige Orbis sales to the work of Orbis International. By purchasing these watches, customers will be helping to make a difference around the world. The men’s edition of the new De Ville Prestige Orbis has a 39.5mm stainless steel case and is equipped with OMEGA’s Co-Axial Calibre 2500. The sun-brushed and lacquered blue dial features a subtle OMEGA teddy bear pattern as well as polished-domed Roman numerals. 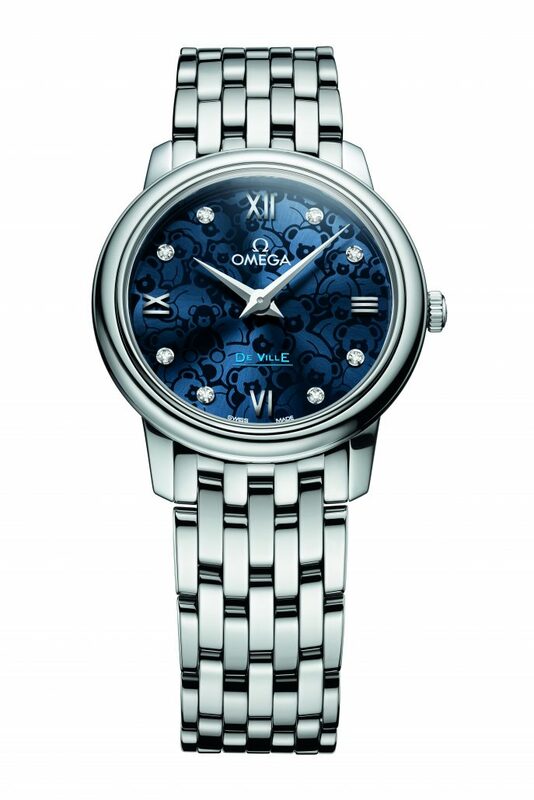 The watch includes rhodium-plated hour and minute hands and an Orbis blue central seconds hand. There is a date window at the 3 o’clock position and the watch comes presented on a handsome blue leather strap. For women, a 32.7mm version has been created with a stainless steel case and an elegant polished Prestige bracelet. Also equipped with OMEGA’s Co-Axial Calibre 2500, the timepiece includes a white mother-of-pearl dial with an OMEGA teddy bear pattern. The dial also features polished-domed Roman numerals as well as eight sparkling diamond indexes. The rhodium-plated hour and minute hands are complemented by an Orbis blue central seconds hand, while a date window has been positioned at 6 o’clock. 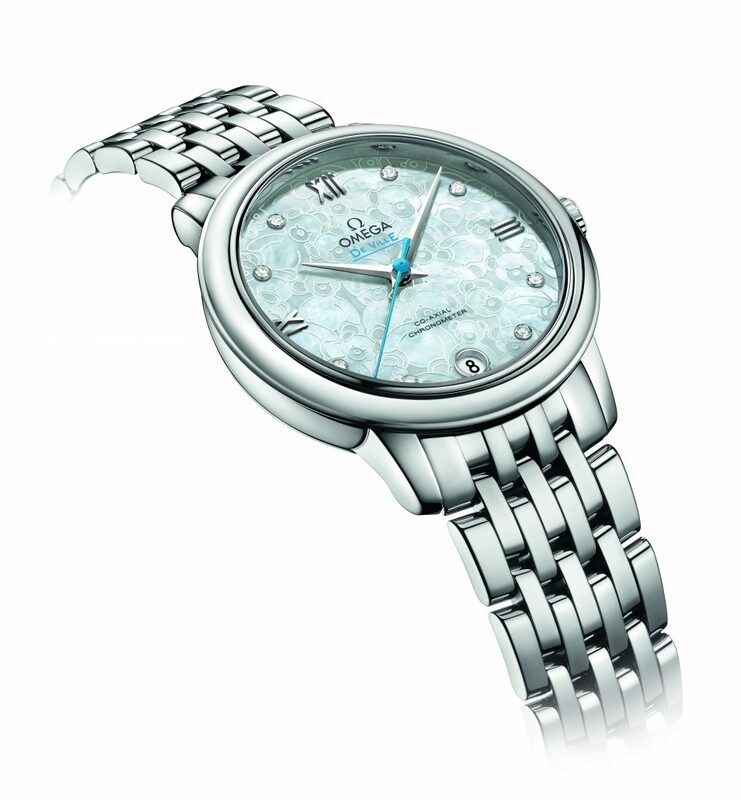 The 27.4mm stainless steel version for women is equipped with OMEGA’s Quartz Calibre 1376. 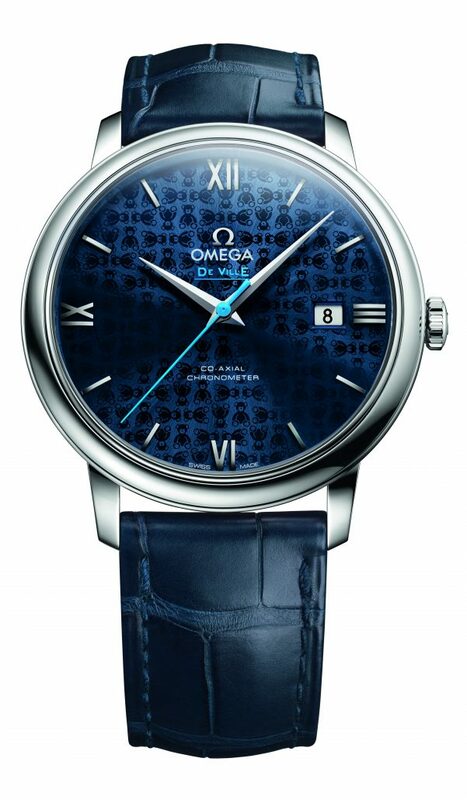 The sun-brushed and lacquered blue dial features an OMEGA teddy bear pattern as well as polished-domed Roman numerals and eight sparkling diamond indexes. The hour and minute hands are rhodium-plated and the final watch comes presented on a polished Prestige bracelet. Huawei Mate 9 By Porsche Design Porsche Macan – Why is it such a success?